A few days ago, we wrote about the Samsung Galaxy S8's Infinity Display. That is, the two Phones will have Samsung's Edge display which curves on either side, but with a much higher screen to body ratio than normal. And now, Evan Blass, who goes by the name evleaks, has published the first proper photo of the device on Venturebeat. 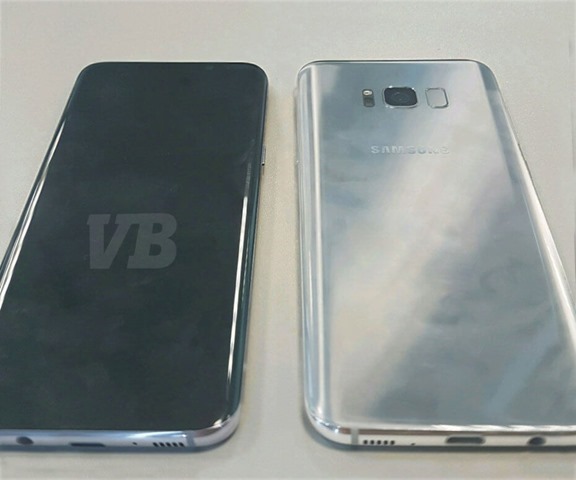 The leaked photo includes a look at the back panel of the Samsung Galaxy S8. The odd looking rectangle, next to the camera, is the Fingerprint Scanner. The placement is weird, but Samsung had no choice but to move the sensor, to the back, since the front has no room for anything other than the display, the front camera, and the iris scanner. The rear camera is similar to the S7's 12 MP lens, but with improved features such as OCR search, while the front camera is an 8 MP lens, an upgrade from the S7's 5MP. Both lenses on the S8 will have f/1.7 apertures. You can see the USB Type C port on the bottom, next to a 3.5mm Audio Jack. The 5.8 inch variant of the Samsung Galaxy S8, will be backed with a 3000mAh battery, while a 3500mAh battery will back the 6.2-inch S8. The phones will be powered by the new 10nm Qualcomm Snapdragon 835 processor, and the company's own Exynos processors, with 4GB of RAM. The phones will have 64GB of internal storage, with support for up to 256GB via a microSD card slot. The displays of the S8, will support force touch, pressure-sensitive input on the lower part of the display. Samsung will launch the Galaxy S8, on March 29, in a Galaxy unpacked event, in New York City. The 5.8-inch variant will retail for €799 or $850 or Rs. 58,000, while the 6.2-inch variant will retail at €899 or $960 or Rs. 65,000. The devices will reportedly go on sale from April 21st.